From an Article by Lee Gardner, Chronicle of Higher Education, October 7, 2013. 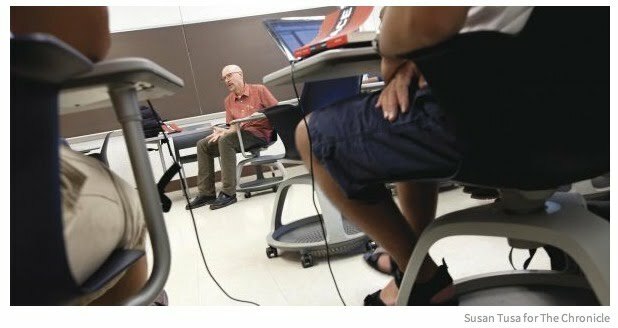 Jon Sticklen, an associate professor at Michigan State University and director of its program in applied engineering sciences, beams when he talks about teaching in Michigan State's new Rooms for Engaged and Active Learning, aka REAL. Mr. Sticklen says he asks students enrolled in classes in his REAL spaces to familiarize themselves with material relating to a new assignment—say, modeling carbon systems—then devotes every minute of class time to their working together at the six-seat tables. "Our students, when they graduate and get in the real world, are all about communication and teamwork and problem solving in areas they haven't seen before," he says. "This facility is really on mark for getting close to that real-world experience."